retrogameart.com: OUR LOSS of INNOCENCE: Into the new Millennia, Color FADES, and Game Box Art Enters a New and Darker World. 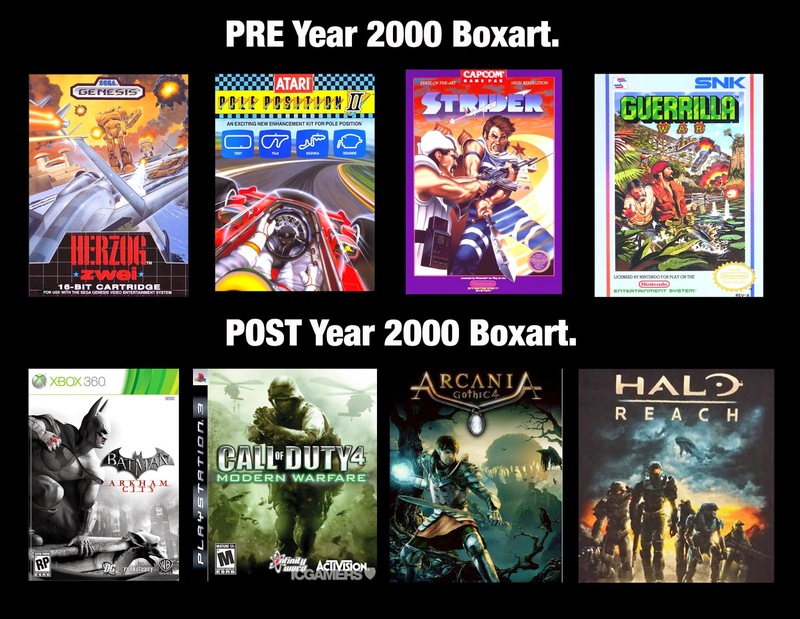 OUR LOSS of INNOCENCE: Into the new Millennia, Color FADES, and Game Box Art Enters a New and Darker World. accounted for the gameplay scenarios, situations, dangers, and triumphs. My illustration is on the left, and gameplay on the right. STRONG, BRIGHT COLORS WAS THE NAME OF THE GAME. 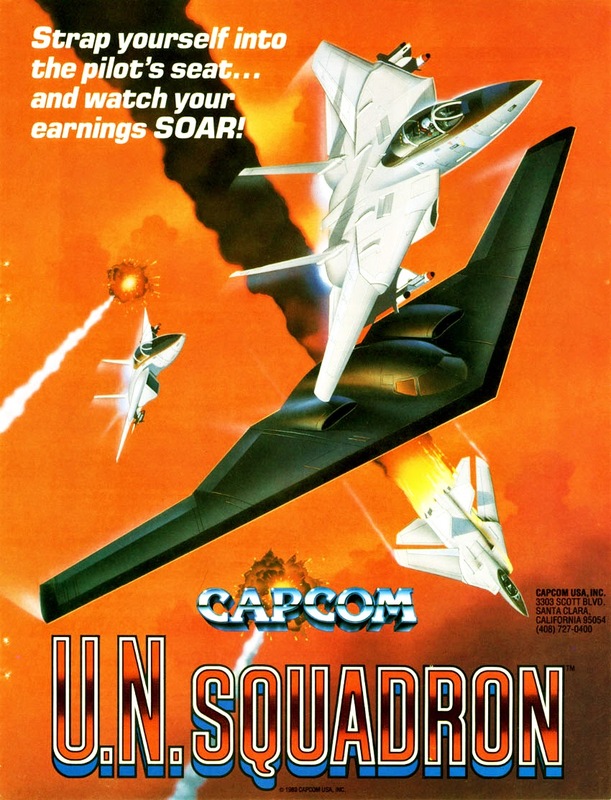 From the age of about 30, I was involved in the creation of Video Game Box Art for almost every company producing games for players, and the key was always attempting to visualize in an exciting visual of what I was shown on the screen, for the purpose of enticing gamers to try the new game. I also produced a lot of what was called P.O.P., or Point Of Purchase display art. These were typically posters, but could also be stand up counter top cutouts, and even banners. 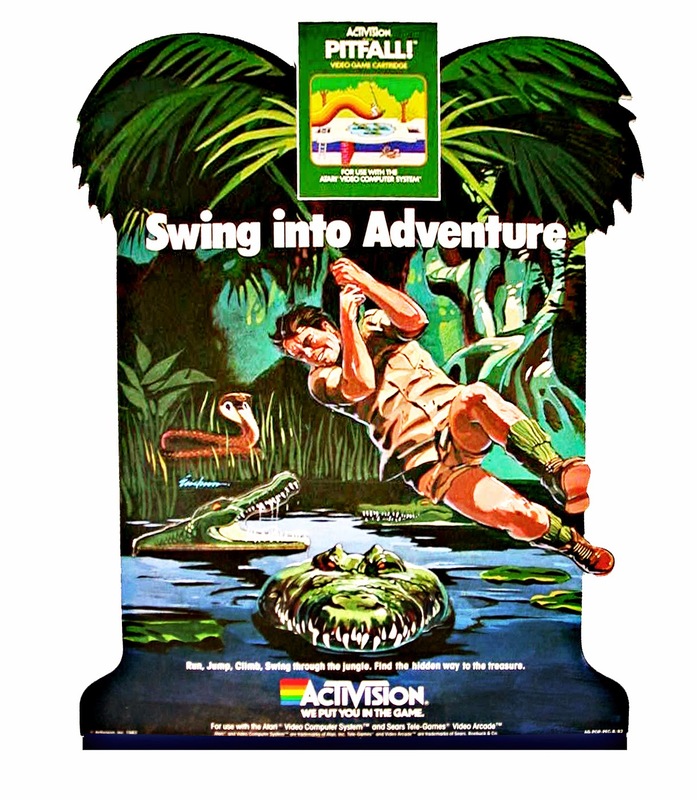 Activision was a company that issued very design oriented box art, and to counteract the approach would often feature P.O.P. materials and magazine ads that were much more realistic. I did several pieces for them for their top selling 'Pitfall', starring Pitfall Harry. Again, intense color was a key element. for posters and magazine ads. Details in the cockpit have always been a big favorite. 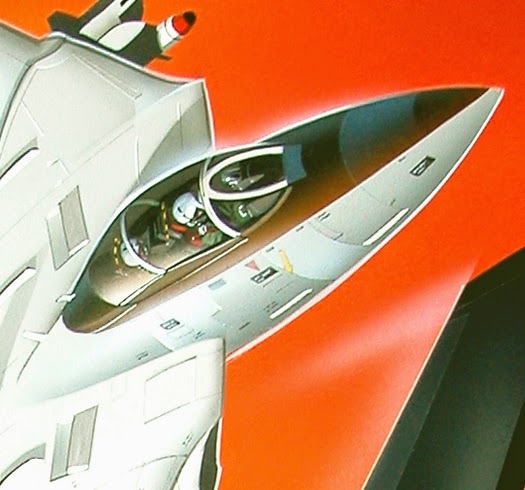 When Capcom created a game named UN Squadron, they contacted me to produce a large poster for their distribution, and I felt the color intensity for this piece deserved to be striking, so I chose a strong yellow orange sky as the backdrop for their dueling aircraft. Strong color and value, and entertaining and exciting action, carried video game art for 2 decades, before the cracks began to appear: More realistic gameplay animation was a consequence of technological progression, and I had known from the beginning that it would become the major force in box art, and eventually negate the need for illustrations from outsiders to be done for covers. It was actually amazing to me that it took as long as it did, to be honest. I was always cautious not to be exclusively a video game artist, and my clients over those two decades included tech companies like Varian and Intel, for whom I did high tech cut away art, And companies such as Ocean Spray and Hidden Valley, illustrations for food product packaging, cartooning, presentation art for The Chicago Field Museum, and The Ford Aviation Museum in Dearborn Michigan, through Academy Art Studios. I also continued to do storyboarding for most of the major Advertising Agencies and Design firms in San Francisco, , as well as editorial and sports illustrations, doing art for the S.F. Giants, San jose Sharks, the Forty Niners, and the University of California and Stanford Football programs. 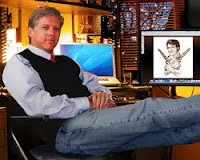 I saw myself through the transition to digital media, learning, with the great help of my studio mate of many years, Robert Evans, to use Photoshop, and to a lesser degree Adobe Illustrator. IN 2003, I DID MY FINAL VIDEO GAME BOX ART. 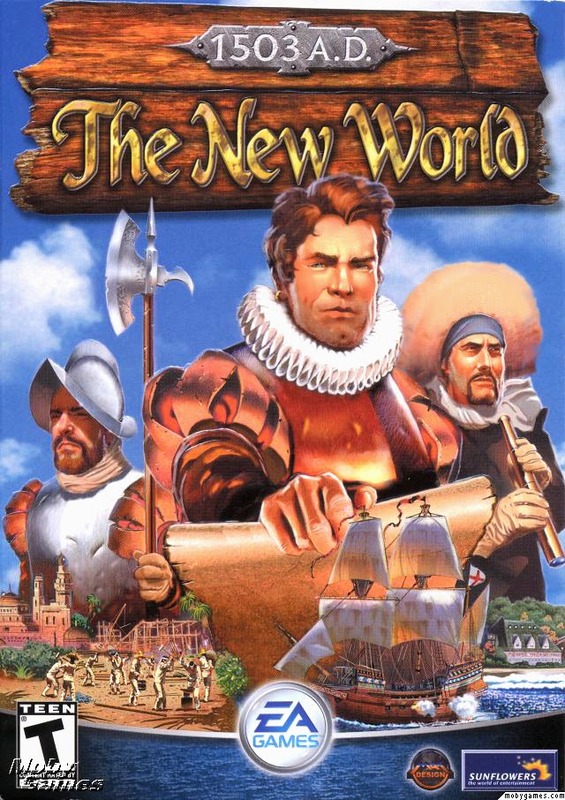 Electronic Arts contacted me to do 'The New World 1503'. Fittingly, Robert posed as the Conquistador soldier behind the Viceroy adventurer, who I made up from sketches. Another close friend, Denis Kelly, a Marin County Realtor, posed as the captain holding the telescope. THE SLIDE INTO PERFECT DESTRUCTION. 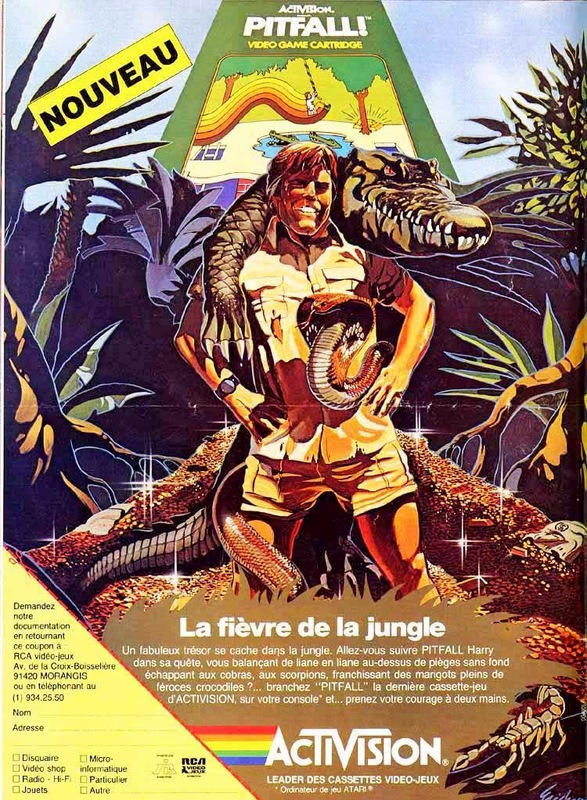 It was at this time that the animation of the games began to appear regularly on the boxes, and rightfully so, as the animation has become incredibly complete, and realistic. In my estimation, Games began to take on a more sinister dimension. The face that society has yet to find an answer for. Power, control, strength, and destruction. The emergence of first person shooter games of such corrosive reality that the action is breathtaking in the realism of its destruction. I'm alarmed by the addictive nature of their casual brutality. Just because developers now have the capacity go there, does that mean they SHOULD? ….My personal view is absolutely not, but I recognize that just as with any culture, we don't come equipped with brakes, and certainly there's no reverse. So, Batman has been stripped of his bluff altruistic nature as a two fisted crime fighter and friend of the common man, and remade into a twisted confused and dangerous maladroit split personality. WHERE DID OUR COLOR GO? As a free lance illustrator working out of San Francisco, I was commissioned to produce cover art and peripheral art for over 90 titles by every major software company involved in video gaming during the eighties and nineties. My clients included Atari, Broderbund, HESware, Activision, SNK, SSI, Sega Genesis, Tronix, Electronic Arts, Capcom, Data East, and many more. I produced cover art for Bad Dudes, Choplifter, Tetris, Afterburner, Megaman2, Galaga, G-Loc, POW: Prisoner of War, Guerrilla War, Atomic Runner, Bermuda Triangle, and over ninety others. Using my library of high resolution 5x7 and 8x10 color transparencies of the original art, many of these lost illustrations will be reproduced in high resolution museum quality prints. This site carries a link to enable viewers to browse the best of my cover art illustrations for purchase in a range of sizes and paper selections. Thank you for visiting.